RANGOON—Pro-democracy icon Aung San Suu Kyi has fallen ill while campaigning for Burma's upcoming by-elections and has suspended her extensive tour of the country a week ahead of the polls, her party said Sunday. Kyi Toe, deputy information officer for her National League for Democracy (NLD) party, said that Suu Kyi's personal physician advised taking the break after she fell ill with vomiting while campaigning in the Mergui archipelago in southernmost Burma. Her accompanying doctor, Tin Myo Win, said the 66-year-old's ill health was due to exhaustion and the hot weather, according to Kyi Toe. Party members traveling with the Nobel Peace Prize laureate said she had been put on an intravenous drip. 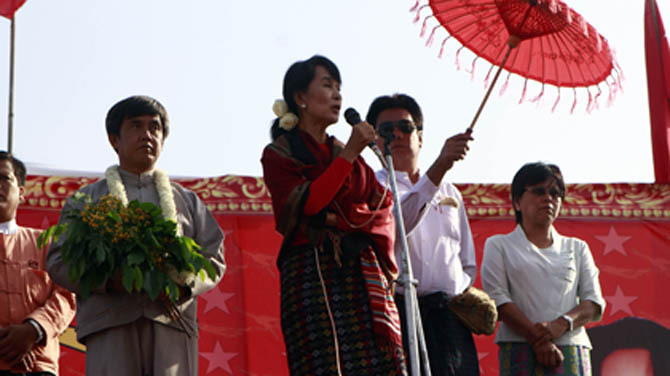 Released from house arrest in 2010, Suu Kyi has traveled thousands of miles by car, plane and boat to campaign around the country for her party. She herself is running in a constituency south of former capital Rangoon. The polls are the first in which Suu Kyi's party is taking part since it won a 1990 general election only to have the army refuse to let it take power, kicking off two decades of military repression. They are seen as an indicator of political reforms by Burma's current military-aligned government since a 2010 election that the opposition boycotted. Suu Kyi fell ill on Saturday during a grueling day of boat travel that saw her vessel go temporarily aground. NLD members, who asked not to be identified because they were not authorized to speak to the media, said the authorities denied her party the use of a larger ferry-type vessel which would have allowed her to travel faster, so her group was forced to use three smaller boats which made the journey's duration three times as long. Despite her illness, she briefly addressed a crowd of 10,000 people in Mergui on Sunday, mentioning the problem in obtaining a fast boat and promising to return when she is well. She has generally drawn large and enthusiastic crowds on the campaign trail, aside from appearances near the custom-built capital Naypyidaw, whose large population of civil servants and soldiers owe their living to the government. She and her party have charged the government with taking measures to handicap her party, such as selective bans on using large public venues including football stadiums. They also have said that voting registries contain the names of dead people, opening up the potential for electoral fraud. Kyi Toe said Suu Kyi's campaigning had been suspended at least through Wednesday, when she was scheduled to be in central Burma, where one of her intended destinations was Natmauk, the hometown of her father, martyred independence hero Gen Aung San. It is unclear if she will be able to make a scheduled stay the night before the polls in Kawhmu, the constituency where she is running. There were 48 seats at stake in the by-elections, but the Union Election Committee announced on Friday that voting would be postponed in there constituencies of Kachin State where there has been sporadic but sometimes fierce fighting between government troops and ethnic rebels, who have long sought more autonomy and faced increased crackdowns this past year. The NLD intended to contest all 48 seats, though one of its candidates was disqualified. The NLD's participation in the April vote is seen as an endorsement of President Thein Sein's reforms, though Suu Kyi has declared that much more needs to be changed until the country can claim to be democratic. The opposition boycotted the 2010 general election, saying it was neither free nor fair, leaving the field open for a landslide victory by the army-backed Union Solidarity and Development Party and the installation of Thein Sein—the former junta's prime minister—as president. Thein Sein initiated reforms, including the release of political prisoners, and the NLD agreed to rejoin electoral politics after election laws were changed to meet its objections.